Beautiful and Extremely Fine Vintage Millefleur Persian Kerman Rug, Country of Origin / Rug Type: Vintage Persian Rugs, Circa Date: Vintage Mid 20th Century – Millefleur literally means 1,000 flowers and this is the perfect way to describe this stunning Persian Kerman rug. This extremely detailed and beautiful mid century vintage rug is perfect for a large size room that needs a piece of grand enough scale to fill the space. 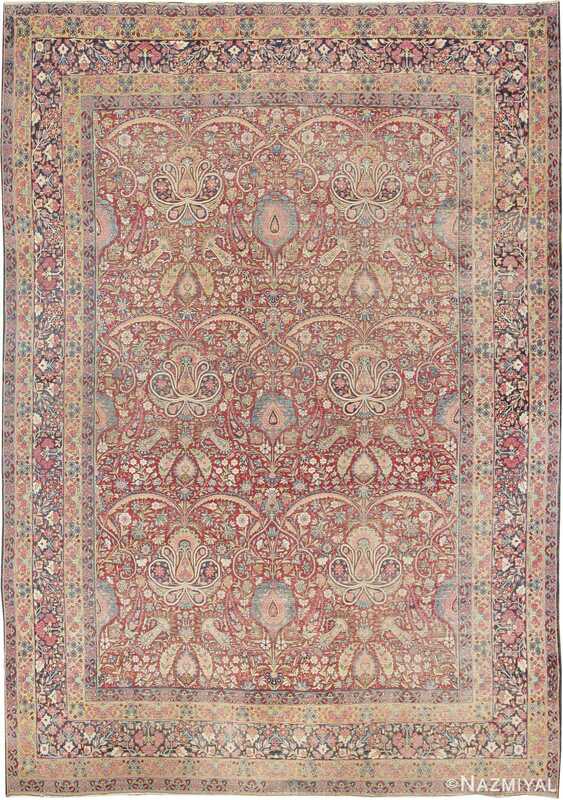 The stunning detail of this vintage Persian rug is carried out in blues, reds, and shades of brown on an ivory background. 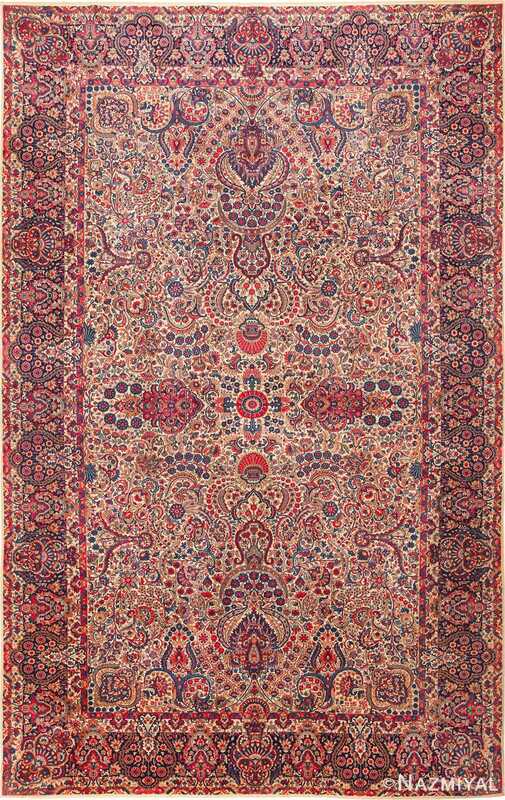 The artist used color saturation to define the major floral shapes and areas of the Persian rug. The stunning level of detail of this vintage Kerman rug is organized into sweeping curvy shapes that are arranged in a traditional rug pattern design. The design itself is based on a central motif that radiates to the four directions. The central motif is surrounded on the ends by complex pendant forms. The corners are bracketed, giving the millefleur Kerman room size rug a sense of balance vertically and horizontally. 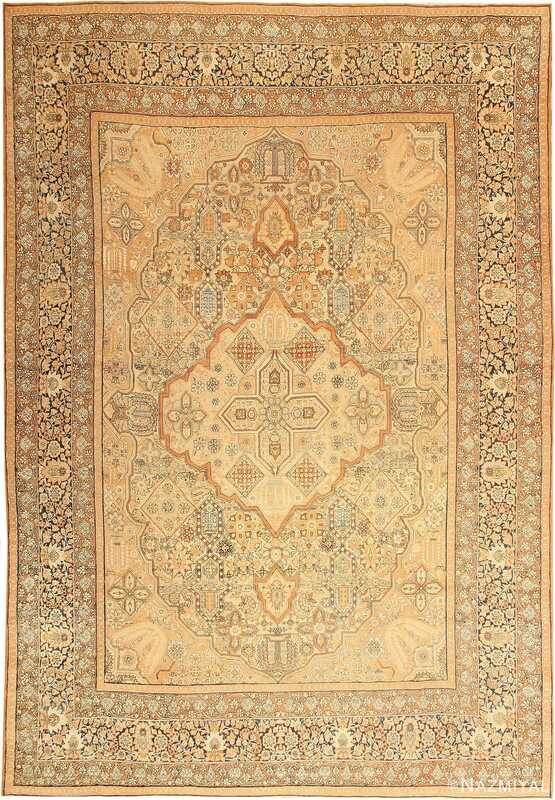 The overall organization of the vintage Kerman Persian rug can clearly be seen when viewed from a distance, rather than having well-defined borders. 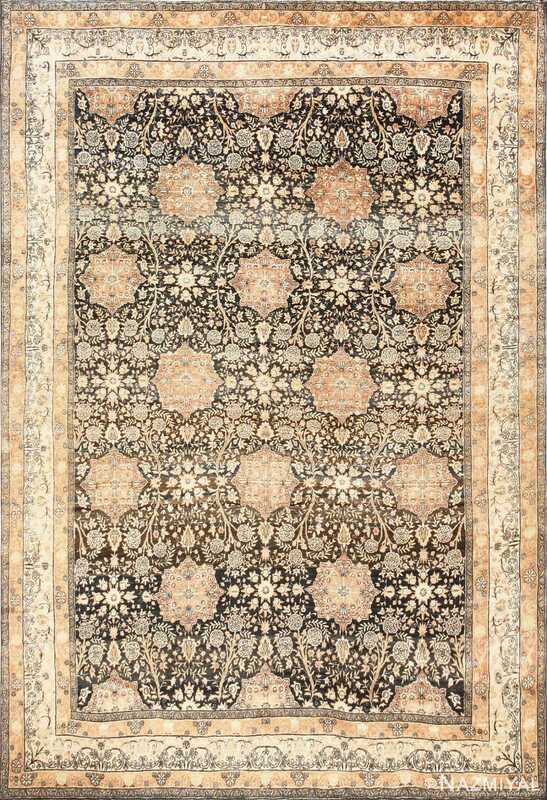 The shapes of the intricate floral millefleur rug ebb and flow into each other creating a splendid visual feast for the eyes. Even though this rug has plenty to offer when viewed from a distance, the detail of this vintage Persian rug, that was woven in the Persian city of Kerman, begs for a closer examination. The rug weaver used shading, outlining, and techniques that produce an amazing level of detail within each design element, creating a stunning floral rug that will go well in any home or office space that is grand enough to allow it serve as a focal point of the room. This lovely antique Kerman has a grand central medallion with large finials set between lavish cornerpieces of similar design. This finely-detailed Kerman carpet features an exceptional arabesque over a wine-red field decorated with a millefleur-style background.